Input is an agriculture commodity streaming company with a focus on canola, the largest and most profitable crop in Canadian agriculture. Founded in 2012, the company builds on three years of pilot testing in the Input Capital limited partnerships. Input enters into canola streaming contracts with canola farmers in western Canada. Pursuant to the streaming contract, Input purchases a fixed portion of the canola produced, at a fixed price, for the duration of the term of the contract. Our program is ideal for farmers who are expanding or want to expand, but do not have the capital to reach their fullest potential. We help farmers farm without debt, and we help them achieve their maximum yield potential. By taking farmers to the next level, Input Capital earns a share of the farmer’s improved economics, while making him/her more successful as well. 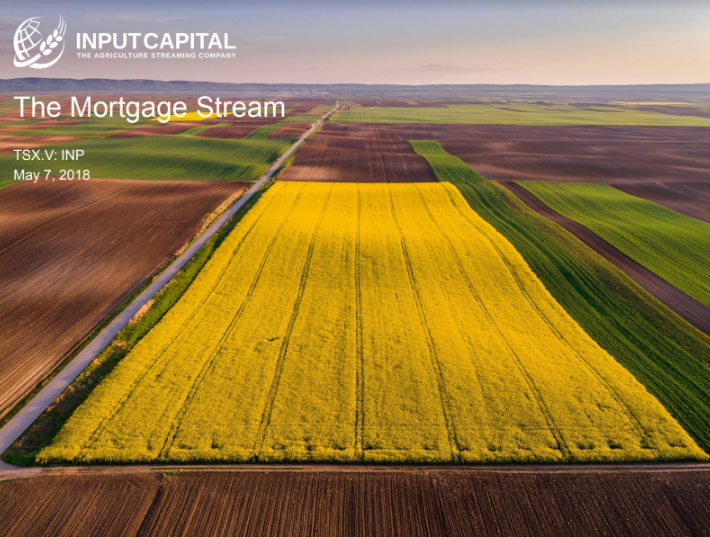 Input is a non-operating farming company with a portfolio of over 300 canola streams, all of which produce canola and revenue for Input in the year the agreement is signed. Input plans to grow and diversify its low cost canola production profile through entering into additional canola streaming contracts with farmers across western Canada. Input is focused on farmers with quality production profiles, excellent upside yield potential, and strong management teams. Input has completed canola streaming contracts in Alberta, Saskatchewan and Manitoba.